Home > Blog > What Makes an Energy Star Window? Energy Star Windows – What Makes an Energy Star Replacement Window? Energy Star is an international designation for energy-efficient products made for consumers in the United States. The Environmental Protection Agency (EPA) and the Department of Energy (DOE) created the Energy Star designation and service mark to differentiate energy-efficient products including replacement windows. So what makes an energy star window an energy-efficient window for use in window replacement? We’re going to answer that question for you in this article and uncover the meaning behind energy star windows and what makes a window energy-efficient. How Much Money Can Energy Star Certified Windows Save You? One of the biggest reasons that people choose Energy Star windows over any windows without this designation is because the windows literally pay for themselves over time. For example, if replacing single pane windows, you could save between $101-$583 per year. If you’re replacing slightly more efficient clear glass double pane windows, you can save up to $197 per year on your heating and cooling bills. According to this data, if your home has old single pane windows, you will be able to benefit the most from making the switch to Energy Star for your window replacement project. The Chicago area and the rest of the northern United States can benefit the most from Energy Star replacement windows. In fact, making the switch results in a $366 savings when replacing single pane windows and $134 in savings from double pane windows on average. 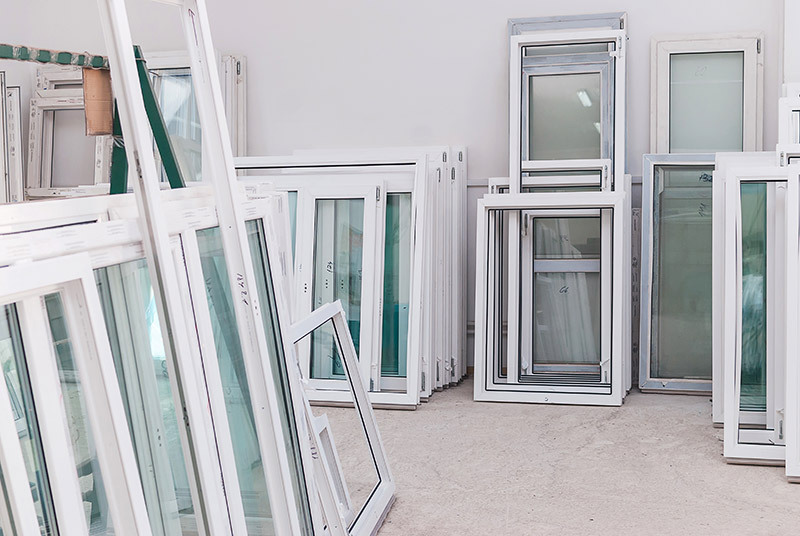 Let’s take a look at some of the components that make up a good replacement window that is built with energy-efficiency in mind. Of course, a proper window installation can make or break the performance of a window but for now, we’ll focus on the window itself. Most Energy Star windows have what is called Low E glass that reduces the effect of the sun’s harmful UV rays passing through the window into your home. A typical double pane window allows about 75% of the sun’s heat into your home. Energy Star windows significantly decrease the amount of heat gain, the increase of temperature in a space resulting from solar radiation from the sun. So you get all of the light that you want without the feeling that you’re under a magnifying glass when sitting near a window in your home! Low E glass stands for “low emissivity glass” and that is exactly what it does. It limits the amount of ultraviolet light that comes into your home through your windows. This is done by way of a special coating on the glass. That means that the blocked UV light won’t be able to fade your interior fabrics and wall coverings anymore. Argon gas is one of the most abundant gases in the Earth’s atmosphere but did you know that this non-toxic, odorless gas has many benefits in replacement windows? Because of its insulating properties, Argon will actually help you reduce your heating and cooling bills. It’s filled between the panes of your replacement window at the factory so there’s no additional process to add it when buying new windows. One big reason a good window doesn’t let through a draft is because of the internal seal that is created when the sash or sashes of the window are closed. Weatherstripping and rubber seals create an airtight seal that will not allow those chilly drafts. U-factor is a window manufacturing industry standard metric for how resistant a window is to heat transfer. So the question is: how much heat does your window lose from the inside of your home and also how much heat does your window let through from outside on warm-weather days? Heat is transferred by conduction, convection and radiation. Conduction is the transfer of heat between two objects that come into direct contact. For example, a copper pipe that is heated by a blowtorch will conduct heat. Convection is when heat transfers by way of elements like air and water. When warm air inside your house comes in contact with a cold window, a cold draft can happen. Radiation is when heat moves via infrared rays. An example of this is the sun’s radiation moving through your window and causing your home to heat up. U-factor is measured by a rating that usually is between .25 and 1.25. The lower the u-factor rating, the better the window’s insulating power and performance. Solar heat gain coefficient, or SHGC, is the measure of solar radiation that gets transmitted through a window or door. The SHGC is a number between 0 and 1. You might be wondering if SHGC is good or bad, and that depends. If you live in a colder climate where temperatures rarely exceed 80 degrees or so, a higher solar heat gain coefficient is better since you’re getting some free heat from the sun during the winter. If you have Chicago weather, it might be better to have a SHGC in the middle of the range. So Who Tests All of These Windows? The NFRC or National Fenestration Rating Council operates a program that tests and certifies windows, doors and skylights for their energy performance. The NFRC certification label is on all Energy Star window and door products. The Energy Star qualification primarily takes into account the u-factor and solar heat gain coefficient numbers. Are You Ready for Energy Star Windows in Chicago? If you’re considering buying replacement windows, you should definitely be looking for the Energy Star label. Energy Star certified windows will help lower your heating and cooling bills and ultimately save you money. For the best Energy Star windows in Chicago, make sure you get a free quote from Feldco today.